Take Rte. 4 (Main Street) south approximately 15.5 miles. Just before turning left on Reeds Mill Road in Madrid, Twp. you will see the sign pictured here. Go 5 miles. Look for a similar church sign on the left, driveway to the church is on the right. Take Rte. 4 (Main Street) north approximately 25 miles. Just before turning right on Reeds Mill Road in Madrid, Twp. you will see the sign pictured here. Go 5 miles. Look for a similar church sign on the left, driveway to the church is on the right. Take Rte. 142 (Salem Road) west approximately 16.5 miles to Rte.4 in Phillips. Turn right traveling north on Rte. 4 (Rangeley Road) for approximately 6.5 miles. Just before turning right on Reeds Mill Road in Madrid, Twp. you will see the sign pictured here. Go 5 miles. 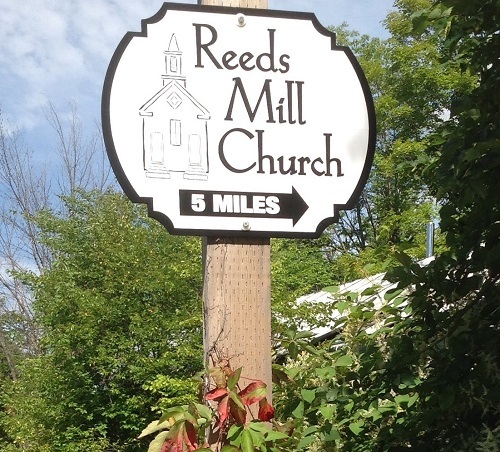 Look for a similar church sign on the left, driveway to the church is on the right.